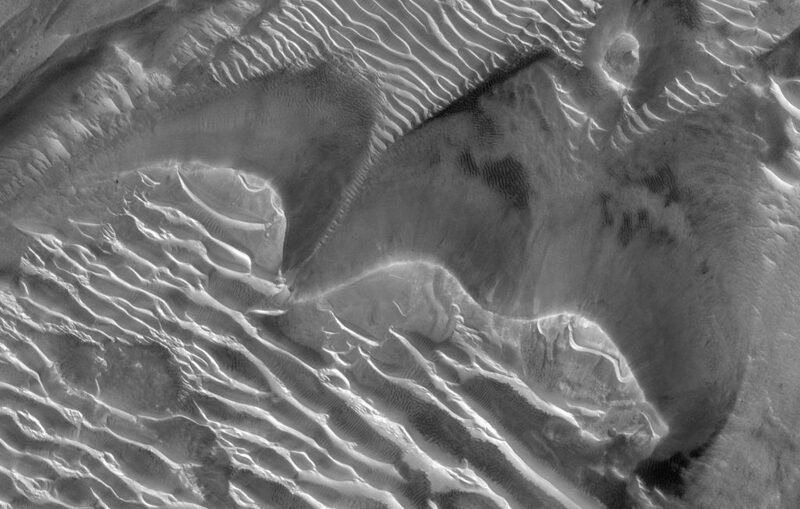 Noachis Terra is an ancient terrain on Mars, located in the mid southern highlands. It’s the home of many dune fields, big and small. Here’s a fairly small one. You can’t see it, but this is the floor of an unnamed crater. 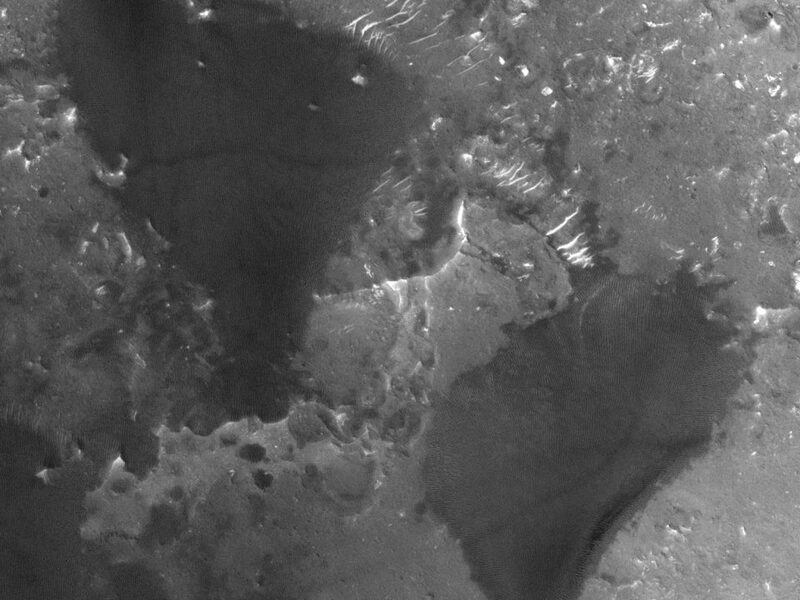 If you follow the link to the CTX image, you’ll see that there’s a much larger dune field to the south, trapped in a pit eroded into the floor of the same crater. If you look carefully, you’ll see that the dunes on the east side look a bit like barchans that are migrating southwestward, and on the west side the dunes look a bit like barchans that are migrating southeastward. This dune field is here because those two winds converge at this point, so sand gets stuck here. In that central dune you can see two slip faces, one indicative of southwestward migration, and one indicative of southeastward migration. 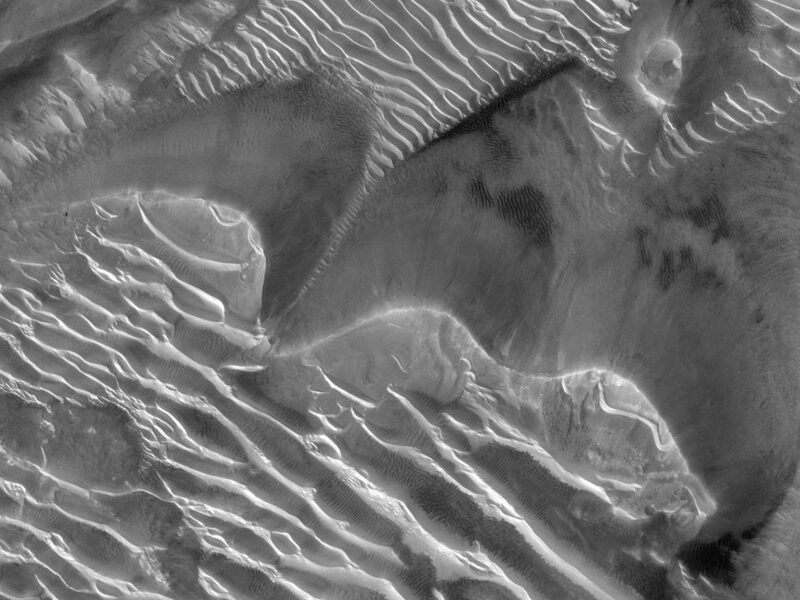 If there were a larger sand supply, these dunes would probably form little fingers that extended southward, toward the net sand transport direction (the Resultant Drift Direction, or RDD). 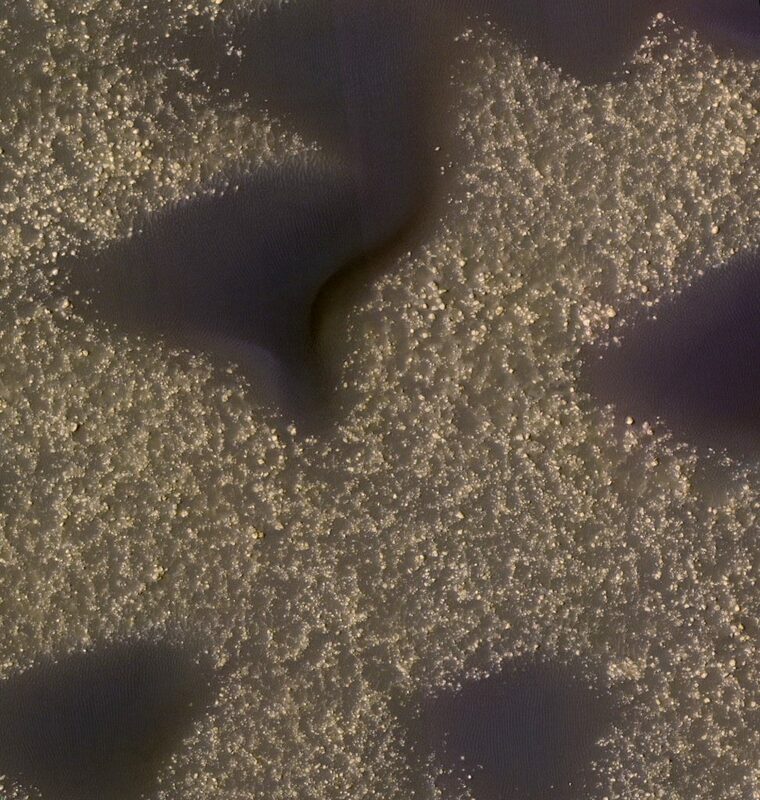 But Mars is typically short of sand (we call it “supply-limited”), so instead we get these two-sided barchans. Those are pretty rare on Earth. 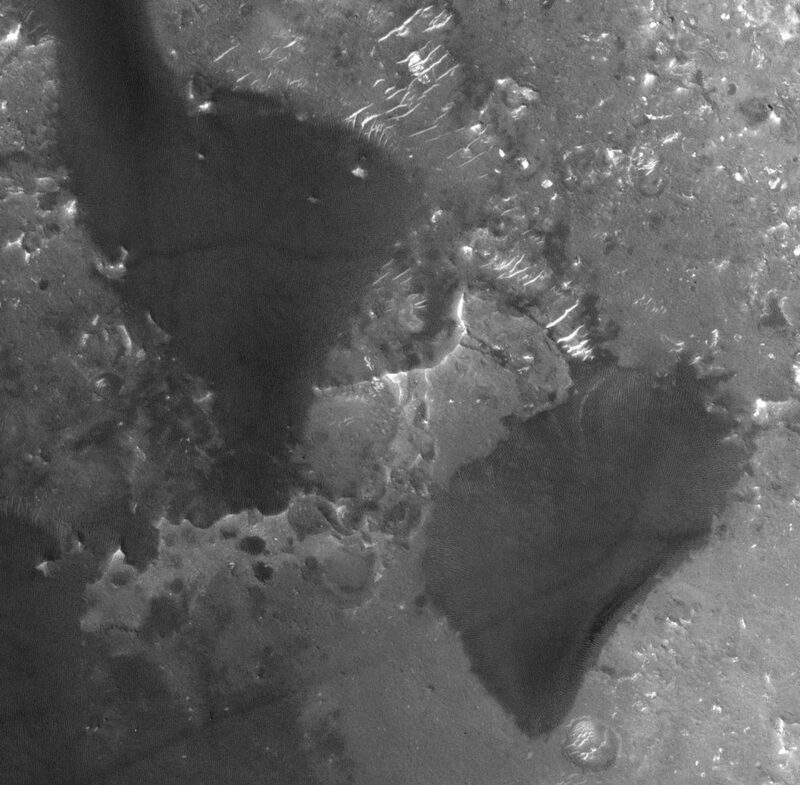 I’ve seen them, but they tend to not last long, as new winds quickly destroy evidence at the surface of old slip faces. 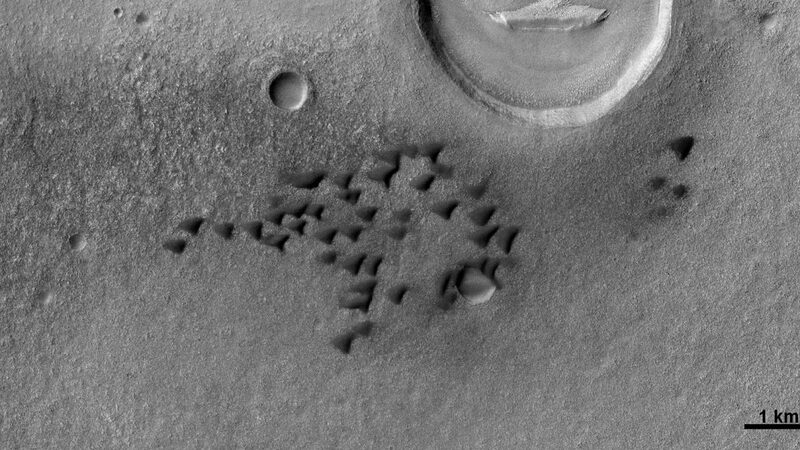 On Mars the slip faces aren’t erased so easily. That’s partly because the sand takes longer to move, since the air is thinner and the sand will only move in the strongest wind gusts. 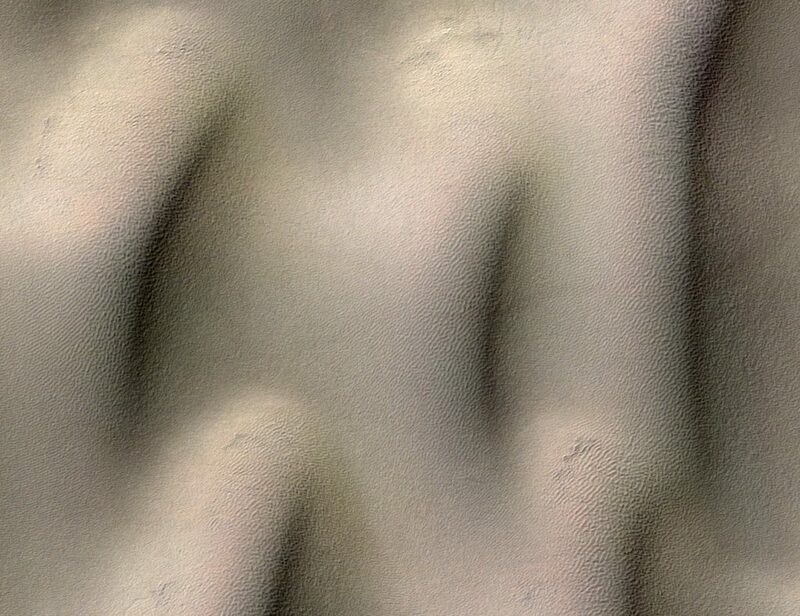 It’s also partly because the simplest dunes (like these) are bigger than those on Earth, and since they’re made of more sand, they take longer for the wind to rework them.